Original Editors - Laura White from Bellarmine University's Pathophysiology of Complex Patient Problems project. Marfan syndrome is a genetic disorder of the connective tissue affecting most notably the skeletal system, cardiovascular system, eyes, and skin, among other body systems. Due to the widespread role of connective tissue throughout the body, individuals with Marfan syndrome may be at risk for many potentially severe or lethal co-moribidities as a result of the disease process. Marfan syndrome is inherited through an autosomal dominant mutation of the gene encoding glycoprotein fibrillin-1 (FBN1), which plays a role in the anchoring of cells to the extra-cellular matrix and is the main component of microfibrils . Microfibrils affect the strength and elasticity of connective tissue, and also control the release of growth factors that cause growth and repair of tissues and organs throughout the body. A defect in this gene means that the quality and/or quantity of fibrillin-1 in the body is decreased, reducing the amount available to form microfibrils, implicating changes in the body’s connective tissues and growth of tissues. Marfan’s most widely known physical characteristics include a tall, thin build with long fingers, arms, and legs. Marfan syndrome affects approximately 1 in 5000 people and is equal between men and women as well as between races and ethnicities. Marfan syndrome is an autosomal dominant disorder, meaning that children with one affected parent have a 50% chance of inheriting the genetic mutation. However, it is estimated that 25% of people with Marfan syndrome did not inherit the disorder but instead experienced a spontaneous genetic mutation at conception of unknown cause. It is very common for people with Marfan syndrome to be myopic. Other ocular symptoms include early glaucoma and cataracts. More than half of those with Marfan syndrome will also experience dislocation of one or both lenses of the eye and possibly retinal detachment. Patients with Marfan syndrome are at risk for a variety of cardiac problems, including: aortic root dilation; aortic valve regurgitation; aortic dissection, aneurysm, or rupture; mitral valve prolapse; bacterial endocarditis; cardiomyopathy; heart murmur; intracranial bleeding/Berry aneurysm; and heart failure. A patient with these complications may complain of shortness of air, heart palpitations, and fatigue. Patients with Marfan syndrome are at risk for dural ectasia later in life, which can be a source of discomfort or pain including low back pain, radiating pain/numbness to the abdomen or legs, bowel and/or bladder changes, and headache. Patients with Marfan syndrome are at risk for recurrent spontaneous pneumothorax which can cause sudden pain (especially on one side of the chest) and/or shortness of air. These patients may also snore or experience sleep apnea. They are also at an increased risk for asthma, pneumonia, bronchitis, emphysema, and cystic lung disease due to the changes in the lung tissue that occur with Marfan syndrome. Stretch marks that are unexplained by weight gain/loss or pregnancy are common in patients with Marfan syndrome. They are also at an increased risk of developing hernias, especially abdominal or inguinal. The section above regarding Characteristics/Clinical Presentation lists many of the co-morbidities associated with Marfan syndrome. Estrogen and progesterone: sometimes used to induce precocious puberty in very tall girls before age 10 to reduce potential adult height. Pain medications: used to relieve pain associated with various musculoskeletal “aches and pains” as well as from dural ectasia. Diagnosis of Marfan syndrome is based on the clinical criteria (see below), and may be assisted by echocardiogram/electrocardiogram/MRI for measurement of the aortic root and detection of valve prolapse, slit-lamp examination for the assessment of lens abnormalities, x-ray studies of the skeletal system for assessment of characteristic abnormalities, and MRI to assess for dural ectasia. Genetic testing is also available for assistance in the diagnosis of Marfan syndrome, although clinical findings and genetic/family history are currently the most effective methods of diagnosis. If family/genetic history is not contributory, index case diagnosis requires major criteria in 2 organ systems and involvement in a 3rd. Alternatively, if a mutation known to cause Marfan syndrome is present, index case diagnosis requires 1 major criterion in 1 organ system and involvement in a 2nd. Diagnosis of an index case’s relative requires 1 major criterion in family history, 1 major criterion in 1 organ system, and involvement in a 2nd. Minor criteria are used only to score organ system involvement and in themselves do not count toward the diagnosis. Adapted from De Paepe A, Devereux RB, Dietz HC, et al: Revised criteria for Marfan syndrome. American Journal of Medical Genetics 62:417–426, 1996; Loeys B, Nuytinck L, Delvaux I, et al: Genotype and phenotype analysis of 171 patients referred for molecular study of the fibrillin-1 gene FBN1 because of suspected Marfan syndrome. Archives of Internal Medicine 161:2447–2454, 2001. Marfan syndrome is caused by a genetic mutation of the fibrillin-1(FBN1) gene. This defect can be inherited in an autosomal dominant manner from a parent, or can happen spontaneously at conception. In spontaneous cases, the cause of the genetic mutation is unknown. As a syndrome, Marfan’s has many implications on the various body systems. Systemic Involvement associated with Marfan syndrome has been laid out in the Characteristics/Clinical Presentation section above. However, almost every patient with Marfan syndrome will experience musculoskeletal symptoms and nearly 80% experience cardiovascular symptoms, so it would be prudent to expect these body systems to be implicated in a patient with Marfan syndrome. Medical management for Marfan syndrome is individualized for each patient based on their specific clinical manifestations. This often includes preventative measures such as medications or regular diagnostic procedures, as well as surgery. Regular checkups with a cardiologist including routine echocardiograms are recommended for patients with Marfan syndrome to evaluate the size of the aorta and general heart function. Aortic valve repair or replacement surgeries are often performed once the aorta reaches a size which indicates high risk for tear or rupture—generally 4.7-5cm, depending on the height of the individual. Surgery is performed preventatively because the risk of death once the aorta dissects is approximately 40%, and even after emergency surgery the mortality rate is 10-20%. Patients with Marfan syndrome may need the attention of an orthopedic physician to address their musculoskeletal symptoms, including scoliosis, pectus excavatum, and pectus carinatum. These deformities can sometimes lead to infringement of chest expansion causing breathing difficulties, as well as other problems like pain and cosmetic concerns. Some of these conditions may require bracing or surgery. Management by an optometrist or ophthalmologist and regular eye exams are recommended for the patient with Marfan syndrome due to the ocular issues that can occur with this disease. Some problems, like myopia or detached lenses, can be solved with only eyeglasses, contact lenses, or intraocular lens implants if desired. Other issues like glaucoma, cataracts, and detached retina may be managed with eye drops, oral medications, or surgery. Women with Marfan syndrome who wish to become pregnant should be under the medical management of an obstetrician due to the increased strain and even higher risk to the cardiovascular system during pregnancy and birth. Genetic counseling may also be helpful to the mother regarding the likelihood of passing her or her partner’s genetic disorder to their child. Patients with Marfan syndrome may benefit from the medical management of other professionals such as: dentist/orthodontist for dental/cosmetic issues; podiatrist for problems associated with pes planus; neurologist for problems associated with dural ectasia; and pulmonologist for recurrent spontaneous pneumothorax, sleep apnea, and other lung problems. There are no specific protocols used by physical therapists in the management of Marfan syndrome. Because patients with Marfan syndrome have different clinical manifestations, physical therapy may be helpful to the individuals who experience problems from the musculoskeletal issues that are often associated with Marfan syndrome. This includes but is not limited to pes planus, scoliosis, and pectus excavatum and pectus carinatum and the physical issues they may cause. Stretching, strengthening, therapeutic exercises, modalities for pain, fabricating or recommending orthotics, as well as patient education are all valuable tools the physical therapist can use in the management of the patient with Marfan syndrome. Physical therapists can also play a role in advising the patient with Marfan syndrome on the risks and benefits of exercise and participation in sports. Specifically, the patient should be educated on the risk to the cardiovascular system with strenuous and contact sports and should be advised on the National Marfan Foundation’s Physical Activity Guidelines, prepared by the NMF Professional Advisory Board. Further screening for this disease in the physical therapy setting should be considered, especially with patients who appear to fit the typical Marfan body habitus or have a positive family history. Quick screening tools include comparing the patient’s arm span to their body height as well as assessing for unusually hypermobile joints. 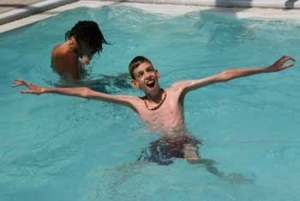 Typically, a person's arm span should be less than their body height; an increased arm span to body height ratio of >1.05 is considered a positive sign for Marfan syndrome. Using the Wrist Sign and/or Thumb Sign is also another quick screen which can be used in clinic. The National Marfan Foundation describes the tests: “The thumb sign (a) is positive when the entire distal phalanx of the adducted thumb extends beyond the ulnar border of the palm with or without the assistance of the patient or examiner to achieve maximal adduction. The wrist sign (b) is positive when the tip of the thumb covers the entire fingernail of the fifth finger when wrapped around the contralateral wrist.” A positive sign of either of these tests, combined with a thorough medical history and pertinent clinical findings, may help the physical therapist determine whether further referral may be necessary for a patient with symptoms consistent with Marfan syndrome. ↑ 1.0 1.1 1.2 PubMed Health Web site. Diseases and Conditions: Marfan syndrome. Available at: http://www.ncbi.nlm.nih.gov/pubmedhealth/PMH0001455. Accessed February 27, 2011. ↑ 2.0 2.1 2.2 2.3 2.4 2.5 2.6 2.7 2.8 The Merck Manuals Online Medical Library: The Merck Manual for Healthcare Professionals Web site. Marfan Syndrome. Available at: http://www.merckmanuals.com/professional/sec19/ch284/ch284d.html?qt=Marfan%20syndrome&alt=sh. Accessed February 27, 2011. ↑ 3.0 3.1 3.2 3.3 3.4 3.5 3.6 National Library of Medicine Web site. Genetics Home Reference: Marfan syndrome. Available at: http://ghr.nlm.nih.gov/condition/marfan-syndrome. Accessed February 27, 2011. ↑ 4.0 4.1 4.2 4.3 4.4 4.5 4.6 4.7 Mayo Clinic Web site. Marfan syndrome. Available at: http://www.mayoclinic.com/health/marfan-syndrome/DS00540. Accessed February 27, 2011. ↑ 5.00 5.01 5.02 5.03 5.04 5.05 5.06 5.07 5.08 5.09 5.10 5.11 5.12 National Marfan Foundation Web site. Available at: http://www.marfan.org/marfan/. Accessed February 27, 2011. ↑ 6.0 6.1 6.2 6.3 6.4 6.5 6.6 6.7 6.8 National Human Genome Research Institute Web site. Learning About Marfan Syndrome. Available at: http://www.genome.gov/19519224. Accessed February 27, 2011. ↑ 7.00 7.01 7.02 7.03 7.04 7.05 7.06 7.07 7.08 7.09 7.10 7.11 7.12 7.13 National Institute of Arthritis and Musculoskeletal and Skin Diseases Web site. Marfan Syndrome. Available at: http://www.niams.nih.gov/Health_Info/Marfan_Syndrome/default.asp. Accessed February 27, 2011. ↑ 8.0 8.1 8.2 8.3 8.4 8.5 8.6 National Heart Lung and Blood Institute’s Diseases and Conditions Index Web site. Marfan Syndrome. Available at: http://www.nhlbi.nih.gov/health/dci/Diseases/mar/mar_whatis.html. Accessed February 27, 2011. ↑ 9.0 9.1 9.2 9.3 9.4 9.5 9.6 9.7 9.8 Cleveland Clinic Web site. Diseases and Conditions- Marfan Syndrome. Available at: http://my.clevelandclinic.org/heart/disorders/aorta_marfan/marfan.aspx. Accessed February 27, 2011. ↑ American Heart Association Web site. Marfan Syndrome. Available at: http://www.americanheart.org/presenter.jhtml?identifier=4672. Accessed February 27, 2011. ↑ 12.0 12.1 Cincinnati Children's Web site. Heart-Related Syndromes: Marfan Syndrome. Available at: http://www.cincinnatichildrens.org/health/heart-encyclopedia/disease/syndrome/marfan.htm. Accessed April 16, 2011. ↑ National Marfan Foundation Web site. Physical Activity Guidelines prepared by the NMF Professional Advisory Board. Available at: http://www.marfan.org/marfan/2728/Physical-Activity-Guidelines. Accessed February 27, 2011.